Japanese footwear – geta and zori sandals. When wearing these, one dons 「Tabi」 socks. The only producer of these socks still making them in Japan is 「SOU・SOU tabi」. The shop interior is bright, clean, and stylish. The most popular item is the 「Tabi Shoes」, which are made from 「Tabi」 fabric, making them lightweight and easy to wear. The shop also carries a range of other items and accessories. Choose from solid colors to patterned motifs – just handling the merchandise is fun! If you like kimono, yukata, and other traditional clothing, this is a must-stop for you. These are shoes made from tabi fabric. They are available in many styles and are easy to wear. One stylish way to wear them is to detach the Kohaze clasp and show off a bit of the lining. Because these are made from cloth, they are best not worn on rainy days. Tabi socks are sold here under the name of “Tabishita.” There is a wide array of colors and patterns, so you can take the time to choose the one you like best. They stock everything from children’s to adults’ sizes. Smartphone covers in dazzling pop-styled patterns. There are tons, and they’re all super cute. They are sized for different iPhone and Android devices. These adhesive plaster bandages will color your fingers in style. Available in ten varieties. They are specially designed to be easy to peel off and gentle on the skin, yet they stay on strong. 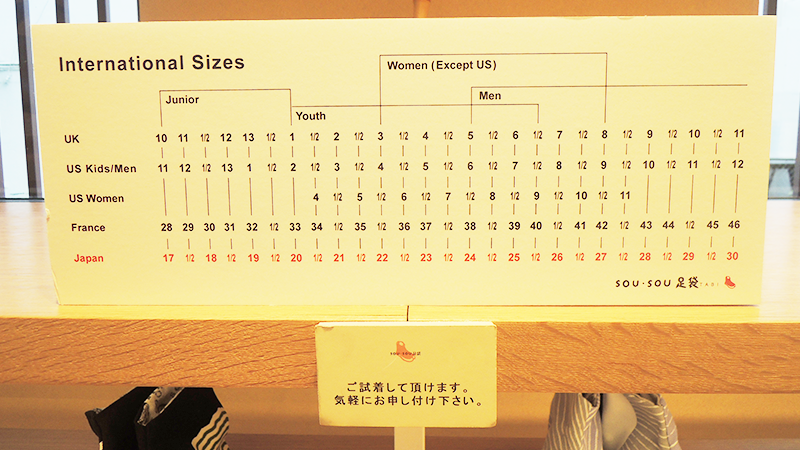 If you find a set of Tabishita or Tabi Shoes that you like, check the size chart and tell a shop clerk. You can try them on if they are in stock. 「Tabi Shoes」come in two major varieties – simple solids that go with any outfit and more dashing and bold patterned styles. Why not buy both? 3-minute walk from Hankyu Kawaramachi Station. The staff can speak simple everyday English.